Home + News + Where Can Paint Cans Be Stored? Where Can Paint Cans Be Stored? Different types of paint have different storage requirements. Solvent-based paints contain flammable materials and have stricter storage requirements. Water-based paints are less hazardous and have fewer restrictions. It is important to know what kind of paint you are storing and relevant OSHA and NFPA requirements. Paint manufacturers supply a Safety Data Sheet (SDS) for their products. The SDS notes key properties of the paint along with recommendations for storing paint safely. Check the flashpoint of the product to identify whether it is flammable. OSHA 1910.106 covers flammable materials and their storage requirements. This standard breaks flammable liquids down into categories. Category 1 flammable liquids have a flashpoint below 73.4 F (23 C) and a boiling point below 95 F (35 C). Category 4 flammable liquids have a flashpoint between 140 F (60 C) and 199.4 F (93 C). The higher the concentration of solvent in the paint, the higher the flammability category it will be. NFPA 30 gives a similar breakdown of types of flammable and combustible materials. Paint falls into the combustible liquid definition with a flashpoint greater than 100 F (37.8 C). Volume limits for flammable liquids such as solvent-based paints are determined by its category. When storing 25 gallons or less of flammable liquids, no storage cabinet is necessary. 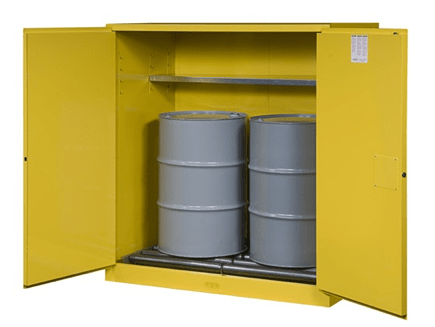 Always store up to 60 gallons of Category 1, 2 or 3 flammable liquids or up to 120 gallons of Category 4 flammable materials inside a flammable safety cabinet. Storage areas may contain a maximum of 3 safety cabinets. Sure-Grip® EX Combustible Safety Cabinets for Paint and Ink feature fire-resistant construction. Adjustable shelves allow easy storage of different size paint containers. A leakproof sump captures leaks and spills. Sure-Grip® EX Safety Storage Cabinets for flammables come in sizes ranging from 4- to 115-gallons. Their 18-gauge double wall construction has 1-1/2-in insulating air space. Self-latching doors close securely to keep the contents safe from fire. Use Sure-Grip® EX Drum Safety Cabinets when storing drums of paint. Drum rollers make loading and unloading easy. Leakproof sumps prevent any leaks from escaping to the environment. 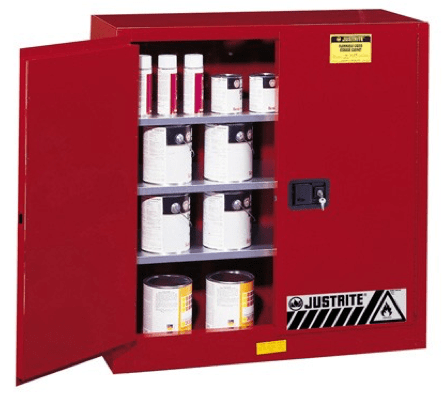 Justrite supplies OSHA-approved safety paint can storage cabinets for flammable and combustible liquids. Order a safety cabinet for paint storage today to stay compliant and prevent incidents. Browse our collection of flammable safety cabinets here. RELATED ARTICLE: Is Paint Thinner Flammable?